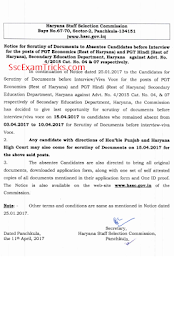 HSSC PGT Hindi Final Result 2018 - www.hssc.gov.in - Haryana PGT Hindi Document verification Schedule Download HSSC PGT Hindi Interview Call Letter Appointment Joining Letters. 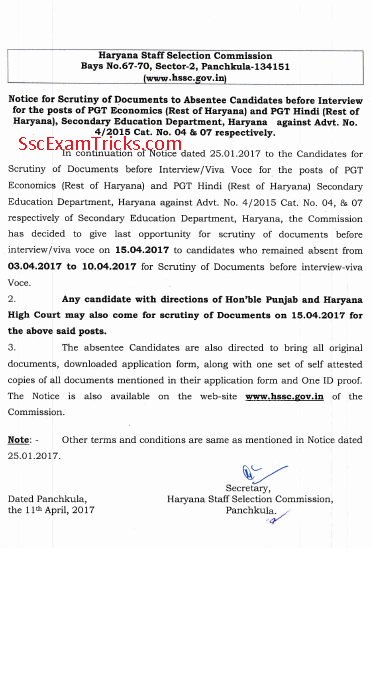 Haryana Staff Selection has released the list of absentees in the scrutiny of original documents before interview for category number 4 and 7 under advt. 4/2015. These candidates are given last chance for scrutiny of their document to be attended on 15th April 2017. They are advised to bring one set of self attested photocopies of documents and one ID proof at the time of verification. Written Exam Pattern: Objective type exam, Offline mode (pen-paper mode/ OMR sheets), 160 marks, Two Parts (each of 80 marks); 75% questions from General Knowledge, Reasoning, Math, Science, English and Hindi language, 25% questions from Current Affairs (Haryana based), Historical facts, Civil etc. The good news is that haryana Staff Selection Commission has released interview schedule for the post of post graduate teacher Hindi rest of Haryana under advertisement number 4/2015 category number 7. The interview has been scheduled to be held on 6th September 2018. Those candidates who have been qualified and Secure marks by last shortlisted list and category wise cutoff marks, they can check the roll number from the list given here. The candidates are advised to bring all their original documents along with that of self attested copies of all original documents with a valid ID proof and recent passport size photograph, print out of application form at the time of interview or interview venue. It is also mandatory to produce interview call letter to the selection committee. The PGT Hindi Final Result will be available on official website of HSSC.